Festival G. : Griffintown Gourmet and Gastronomic from March 7 to 17, 2019. SAVE THE DATE ! 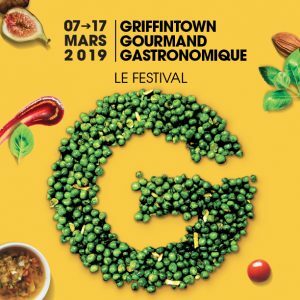 The G. Festival, Griffintown's first major gourmet and gastronomic event, will take place from March 7 to 17, 2019. This Festival, organized by the Business Organization – Les Quartiers du Canal, is an opportunity to celebrate the exceptional gastronomic offer, the great diversity and the originality of our restaurants in Griffintown. It is also an event to salute the work of all teams, chefs and cheffes cooks of our beautiful gourmet addresses, those, who, on a daily basis are ambassadors of our Business and the Gourmet destination of Montreal. For the SDC, it will also be an opportunity to highlight the heritage of our neighborhood and the design that we find in each of our good addresses in Griffintown. – The Evening’s Fine Table d’hôte: from $22 to $52 with a cocktail or a glass of champagne offered as well as a free an appetizer or a dessert. – Happy Hour / 5@7 branchés: $17 or $22 including a free cocktail or glass of champagne. – Gourmet Brunch (2 Saturdays and 2 Sundays): $17 or $22 with a Mimosa or a cocktail offered and a free entrance or dessert. As part of its first gourmet festival G., the SDC – Les Quartiers du Canal and its restaurant members team up with the Foundation of Stars to support pediatric research. The SDC will donate $1 per customer participating to the G. Festival and the restaurants will donate from $1 to $3 per participating client. The total contribution will be unveiled after the festival. These donations will enable the Foundation to continue to protect, promote and improve the health and well-being of children and youth. The G. Festival is an event presented by the Business Development Corporation Les Quartiers du Canal in collaboration with the Economic Development Department of the City of Montreal. Entrepreneurial contest : "i am local and I am available"